The Goose Downs facility lies at the end of a one half mile private road and occupies its own private valley 0f 300+ acres surrounded by four mountain ranges allowing security and ensures aesthetics. Goose Downs is built in the Territorial style with the utmost care to enhance its training and teaching program as well as compliment its beautiful surroundings. Two Territorial style courtyard barns provide maximal horse care with minimal labor. Competitive horses occupy spacious stalls each connected to turnout. They are amply serviced by tack rooms and wash stalls. Tom & Jeffray live over looking the barns and there is staff housing on the farm ensuring continuous oversight. There is a guest house for students, clinicians as well as guests. Teaching and Training Facilities: Our facilities are extensive and designed for maximum safety and efficiency. We feature two full size dressage arenas with sand footing. Each arena has arc lights for riding at night. Our jumping arena is a spacious one-acre arena with exceptional footing. 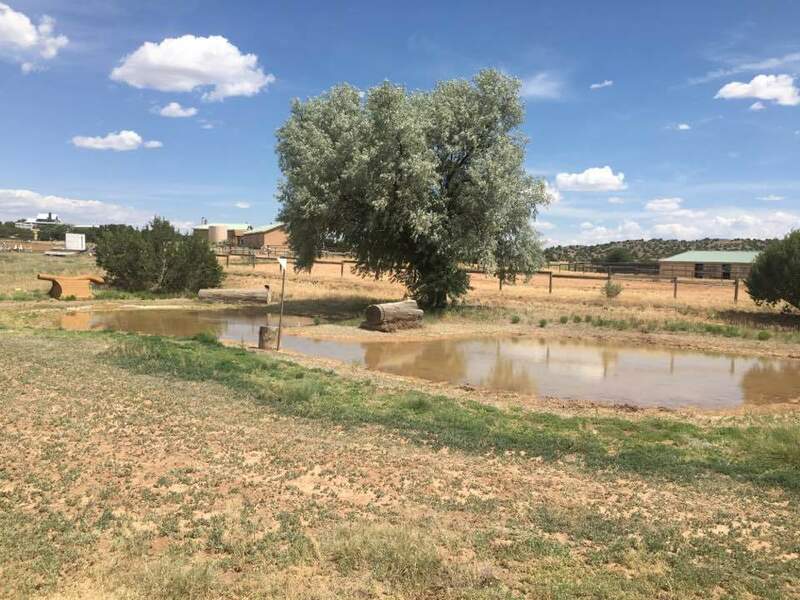 The physical plant has a covered arena, an enclosed outdoor arena and a round pen for teaching beginning students and riding young horses, and a one-mile galloping track over varied terrain for conditioning. But our most exciting feature is our cross-country. Schooling fences include water, ditches, banks and drops. There are 6 courses, Pre-Competition to Intermediate over undulating terrain. The footing is sand enhanced by years of mulching and aerovating. Originally the courses were designed by Captain Mark Phillips and Pete Costello and built by Pete Costello. They are now being designed and kept up by Tom Angle. We add to the courses continually; most recently adding the "tadpole" course to encourage newbies to "give it a try".